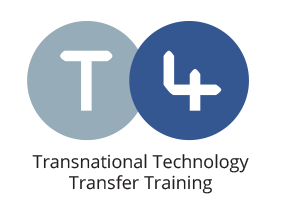 We are very pleased to inform you that the E-learning platform dedicated to the transnational technology- transfer manager course can be accessed at: https://www.t4.ugal.ro/elearning/login/index.php. Those who are interested, especially: managers, technical and administrative staff members, consultants from SMEs; technical staff members and consultants from cluster organizations; researchers and technical staff members from R&D centers/universities (including their technology transfer departments); technical staff members and consultants from technology parks and centers of business development; policy officials, management and technical staff members from economic development bodies (regional development agencies, government policy makers), trainers, researchers, technical and administrative staff members, students from vocational education and higher education institutions, can enroll on the platform to access course information and to be eligible for a degree certificate at the end of the training. Additional information about ERASMUS+ international project entitled “Transnational Technology Transfer Training: Training Blueprint for Accelerated Growth“ (acronym T4 – number 2016-1-RO01-KA202-024519, duration 24 months), together with foreign partners from Italy (FVB SRL and Consorzio Intellimech), Austria (Carinthia University of Applied Sciences), Croatia (Polytechnic of Šibenik/Veleučilište u Šibeniku and Croatian Chamber of Economy CCE) and Slovenia (Pomurje Technology Park), can be found on the project website: http://t4.p-tech.si/. The future begins today. It is up to us to envisage the evolution direction of the technique, in particular and of science, in general.